These are just suggestions though for what to fix on Valentine’s Day. You never have to stick to the classic Valentine’s Day food. If you and your loved one want to eat something like pizza tomorrow, then you enjoy eating you some pizza ! Fill a large pot with water and set it over medium-high heat. Once boiling, salt the water, adding in the pasta next and letting it cook until it’s al dente. Drain (we left our pasta in a strainer until it was needed later on). While the pasta is cooking, take a medium-sized saucepan out and add 4 tablespoons of the butter to it, setting the saucepan over medium heat. Once the butter’s melted, stir in the poblano, onion and garlic, cooking it for 7 to 8 minutes or until they’ve softened. Whisk in the flour, continuing to whisk for one minute. Whisk the chicken stock in, bringing the sauce to a simmer. Stir constantly for 5 minutes. Take a small saucepan out and pour the crema into it, setting it over medium heat. Once it’s warm, whisk the crema into the sauce, stirring to combine. Pour the sauce into a food processor or blender (we used a blender), pureeing until “very smooth” (our blender’s strong enough that the sauce was completely smooth). Season the sauce with salt before moving onto the next step. Place the remaining butter in a large skillet, setting the skillet over medium-high heat. Once the butter’s melted, add the shrimp in, cooking them until they’re fully cooked (look pink and feel firm). Season the shrimp with salt and pepper before adding in the pasta and sauce, tossing to coat everything in the sauce. Take a taste before sprinkling on the thyme and parmigiano-reggiano to see if it needs any salt (ours did). Enjoy ! You won’t want to stop eating this until you are so stuffed that you can’t eat anymore ! You taste the poblano in the sauce and the sauce itself has this wonderfully velvety, silky smooth texture to it. The shrimp adds a different texture to the meal and it helps this feel like a complete meal. The parmigiano-reggiano and thyme do make this taste even better but we thought the dish tasted awesome even without them ! Pour the oil into a large skillet and set the heat to medium. Once the oil’s hot, toss in the onion, stirring constantly for 4 minutes or until softened. Add the garlic in, continuing to stir for another 30 seconds. Pour the broth in, seasoning to taste with salt and pepper. Let the broth simmer for 5 minutes before taking the skillet off the heat. Add the pasta to a large pot of salted water, stirring now and then until it reaches al dente. One minute prior to the pasta getting to the al dente phase, add in the spinach, stirring to combine. Drain the pasta and spinach, returning it to the pot afterwards. Pour the sauce in afterwards, tossing it gently to coat the pasta and spinach. Serve immediately, adding on a few grinds of pepper afterwards (we didn’t add the extra pepper). This is supposed to serve 4 but it tastes so good you may want to double this so you can get the portion size that you’ll really want ! 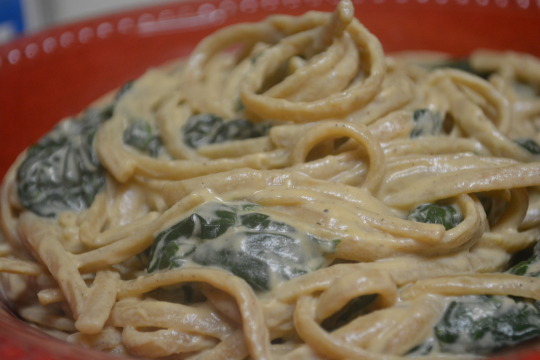 It’s so important to season this, the salt really brings out the cheesy, slightly smoky flavor in the creamy sauce. Don’t know if the spinach adds a lot of flavor but the pop of color it brings to the dish is really nice. Hope you enjoy this as much as we did ! This recipe came from Robin Robertson. We weren’t paid in any form to promote Colavita, Swanson, Silk, Ronzoni, or Robin Robertson. Take a small saucepan out and place the dried porcini mushrooms in it, adding just enough stock to cover* the mushrooms. Set the heat to high and wait for a low boil to occur. Once it is at a low boil, turn the heat down to medium-low and let it simmer for 2 to 5 minutes or until the mushrooms have softened. Take porcini mushrooms out using a slotted spoon, transferring them to a cutting board afterwards. Chop them up and leave them off to the side for now. Strain the stock so that any grit is removed, reserving the strained liquid for later. Take a large pot of water and bring it up to a boil to cook the pasta in later. Take a large skillet out and pour the two tablespoons of olive oil in, tilting the pan twice so the bottom is completely coated, setting the heat to medium-high afterwards. Once the oil’s hot, add the butter in, letting it completely melt. Add half of the mushrooms in, cooking them for 3 to 5 minutes or until they’re brown and fragrant. Take the mushrooms out of the skillet and repeat the process with the other half of the mushrooms**. Return all the cooked mushrooms to the skillet, adding in the shallots, garlic, herbs and lemon zest as well. Season with salt and pepper and pepper and stir constantly for 2 minutes or until the shallots have softened. Salt the boiling water (we used table salt), adding in the pasta afterwards. Cook the pasta a few minutes shy of al dente, about 5 minutes (we went with the 5 minutes). Add the chopped porcini and strained stock into the skillet, pouring the wine in next, waiting for the sauce to come to a boil afterwards. Turn the heat down to medium-low and let the sauce simmer for 3 minutes or until it’s reduced slightly. Drain the pasta and add it into the sauce, turning the heat down to medium-low afterwards. Toss the sauce for about 3 minutes or until the pasta is al dente and has absorbed some of the sauce. Take the skillet off of the heat and stir in the lemon juice and cup of cheese. 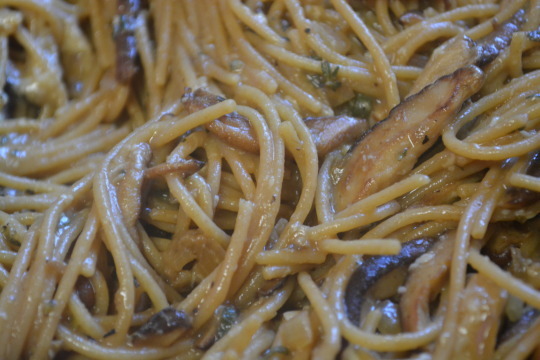 Drizzle some extra-virgin olive oil over the pasta to marry the sauce with the pasta. Top with chives and enjoy ! *Our mushrooms started to float so we were never able to truly “cover” the mushrooms with the stock. We decided to pour in the whole 1 ½ cups. **The first half of the mushrooms absorbed all the butter and oil so we decided to add another 2 tablespoons of oil and butter to the skillet before cooking the second half of the mushrooms. 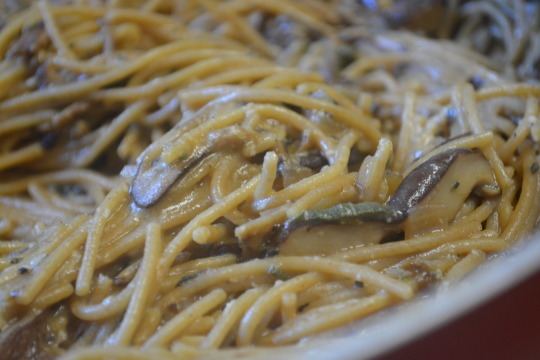 With a name like “Drunken Mushroom Spaghetti”, we had to try this out and see what the dish was like ! Unfortunately you’re not going to get drunk off the finished sauce but this was still a delicious, bright dish. 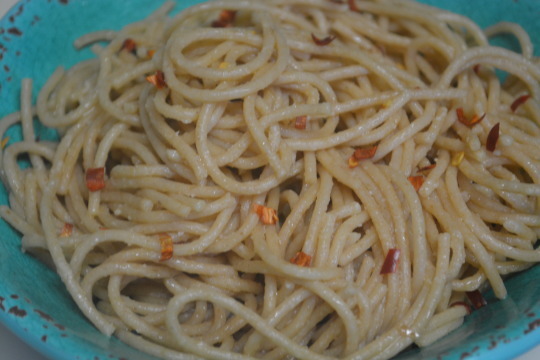 You definitely taste the acidity from the wine and lemon juice and it pairs wonderfully with the salty Pecorino Romano. The chives can add a nice pop of color but we didn’t think that it added any real flavor, whereas some extra cheese only made it even better tasting ! We weren’t paid in any form to promote Ronzoni or Beringer Main & Vine. Pour the olive oil into a large pot, setting the heat to medium. Once the oil’s hot, add in the sliced chile de arbol, stirring constantly for 2 to 3 minutes or until the chile is toasted. Now add in the lemon zest, lemon juice and butter, continuing to stir until the butter has melted. Add the linguine in, tossing to coat, adding in just enough pasta water to loosen up the sauce (if you need any water at all that is). Mix in the parmesan and season to taste with salt. Sprinkle the crumbled chile de arbol over the top and eat immediately. This is such a bright, delicious pasta dish ! You definitely taste the lemon but it isn’t pucker-inducing. Surprisingly this wasn’t spicy though, we definitely would need more chiles to feel any heat in the dish. We still loved the flavor that was in the dish though and loved how easy this dish was to make ! This recipe came from Food Network. We weren’t paid in any form to promote Food Network. Add the cooked pasta and oil to a large mixing bowl, tossing so all the pasta gets coated in the oil. Set the pasta off to the side for now. Add the butter to a large Dutch oven, setting the heat to medium-high. Once the butter’s melted, add the onion in, stirring frequently for 5 minutes or until the onion’s tender. Add the garlic, Creole seasoning, blackened seasoning, salt and cayenne to the Dutch oven, stirring constantly for 1 minute. Pour the wine in, cooking it off for 3 minutes or until it’s almost evaporated. Slowly stir in the cream, milk and lemon juice, stirring constantly for 5 minutes or until the mixture’s slightly thickened. Add the green onion, parsley and crawfish into the Dutch oven, stirring for another minute. Add the pasta into the Dutch oven, stirring to coat for about a minute or until the pasta’s heated through. Take the Dutch oven off the heat and mix in the grated Parmesan, stirring until the cheese has completely melted (at this point we took a bite and decided to add more salt to bring out the flavors more). Take your portion and garnish it with the shaved Parmesan afterwards if you’re using it. We’d never heard of Crawfish Veronica and decided to look it up online. Turns out, this dish is actually a version of Crawfish Monica, a dish served at New Orleans Jazz & Heritage Festival. They say it’s a crowd favorite at the festival and we understand why ! This is such a delicious pasta dish, the flavor of the creole and blackened seasoning comes through but it’s not overwhelming. The flavor of the sauce and crawfish work awesome together, we couldn’t get enough of this tasty dish ! While we still enjoyed eating this the next day, we think it’s tastiest when it’s freshly made. We got this recipe from Louisiana Cookin’ magazine. We weren’t paid in any form to promote Zatarain’s, Old Bay, Seaglass, New Orleans Jazz & Heritage Festival or Louisiana Cookin’ magazine. Preheat the oven to 350 degrees. Cook the pasta based off the directions on the package they came in. While the pasta’s cooking, take a Dutch oven out and add 2 tablespoons of butter into it, setting the heat to medium. Once the butter’s melted, gradually whisk in the flour, stirring constantly for 1 minute after all the flour’s in. Now gradually whisk in the milk and evaporated milk until all of it’s in there and the mixture looks smooth. Continue to stir constantly for 8 to 10 minutes or until it looks like it’s thickened slightly. Whisk in the Gouda cheese, Cheddar cheese, cream cheese, salt and 1/8 tsp. of red pepper until smooth. Take the Dutch oven off the heat and stir in the ham and cooked pasta. Take a 13- x 9-inch baking dish out and coat the inside with cooking spray. Pour the pasta mixture into the baking dish, spreading it out evenly afterwards. In a mixing bow, stir the crushed cereal, one tablespoon of melted butter, and what’s left of the red pepper together. 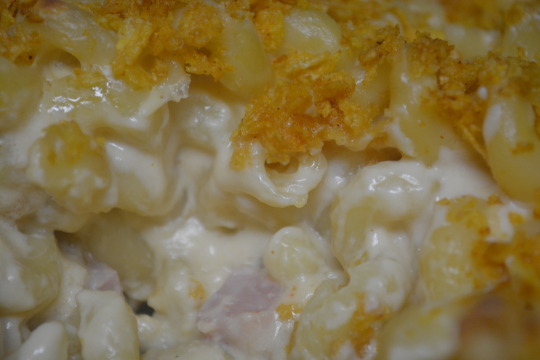 Sprinkle the cereal mixture over the pasta and place the baking dish in the oven for 30 minutes or until the mac & cheese looks golden and bubbly. Let it stand for 5 minutes before eating. This dish definitely lives up to its name ! You can taste smokiness from the Gouda and the ham and it’s definitely cheesy ! The ham also adds a different texture to the dish which is nice. You could easily serve this as a main dish or as a side dish. We got this recipe from Southern Living. We weren’t paid in any form to promote Smithfield or Southern Living.